Falls can be traumatic after a certain age. My father passed away from complications from a fall, one of the most common causes of severe brain injury. He hit his head while helping my mother get groceries out of their car one morning. As tragic as my family's loss was, falls happen all too often to people over 65; the Centers for Disease Control reports that one out of three people over 65 will suffer falls and that they are the leading cause of injury-induced death. Between 20 and 30 percent of fallers suffer the inconvenience of hip, pelvis or spine fractures that not only make it harder for them to get around, but chip away at their self-confidence. Studies show that strength training alone is not enough to prevent falls and improve balance among the elderly. It certainly is important to retain muscle strength as you age, because in your 50s your strength starts to decline at a rate of 12 to 15 percent per year. But do older people trip and stumble more often or are they less able to recover their balance after a stumble or trip? Is it because their balance is off? In a study on the prevention of falling in older folks, the Journal of Strength and Conditioning Research in its February issue stressed the importance of not only power and quadriceps strength, but also of balance training. A lot of factors, like falling history, muscle weakness, eyesight, number of medications, arthritis, fear of falling and home hazards all contribute to fitness decline and falls. The study demonstrated that during the actual fall, lack of lower leg strength predisposes people to fall. Their "swing phase "is off; their thighs aren't strong enough to allow them to regain their balance. This means that these older people end up taking too many small steps or arm reactions and end up tripping. For a simple balance exercise, try rising up on your toes, keeping your weight aligned over your big and second toe. This trains the sensory or balance receptors in your ankle and foot. These muscles send out important sensory information to control standing balance. An exercise such as toe-raises, for example, trains the sensory-motor inputs, all providing valuable information about body position with respect to the supporting surface. (No matter how old you are, stay active. ( Make your home safer by removing clutter from stairways and doorways. Almost half of falls happen at home. ( Have your doctor review your medications for side effects. Some medications can make you light-headed or drowsy, which can lead to a fall. ( Have your eyes or eyeglasses checked. Poor vision can increase your risk of falling. 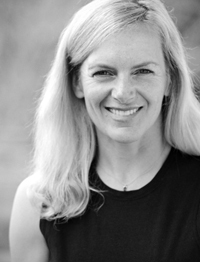 Connie Aronson is a certified personal trainer at the YMCA in Ketchum.